How to use my theme layouts for property archive page? and Save the property configuration form. 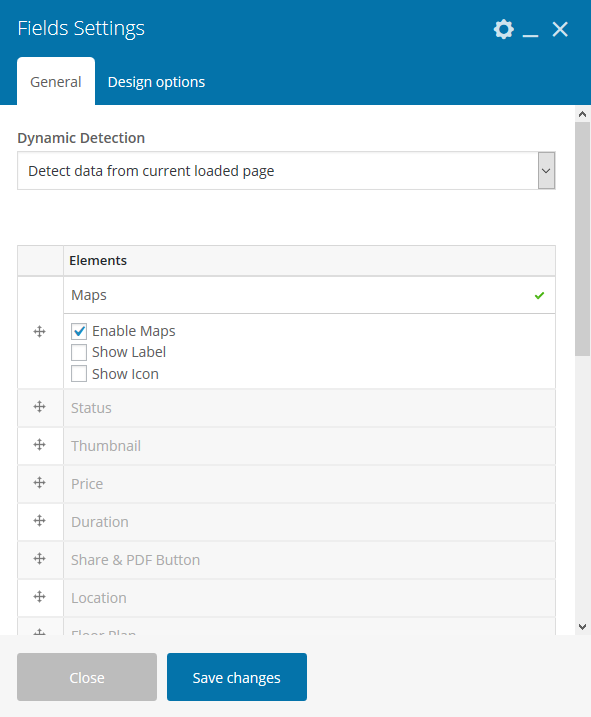 In some cases, you might need to refresh the page permalinks by visiting WordPress Sidebar Menu > Settings > Permalinks. How to use my theme layouts for property single page? How to create advanced property single layout? Create a normal Page content via WordPress sidebar menu > Pages > Add new, In this example we will use WP Bakery Visual Composer as the layout builder. What page builder does this plugin supports? We only officially supports WP-Bakery Composer as the main page builder. Even though technically it is possible to use any page builder that supports manual shortcode injection, it is not recommended as the shortcodes can be complex to craft. In this example we are using WPBakery Composer to build a property search page with shortcodes. Add the Search form to the page, it can be an instance of Advanced Search or Simple Search or Split Search shortcode. Then configure the search form for their search parameters query, available Fields, Attributes and Types. All the search form has the capability to forward the search query to the default property archive page or keep the search query to the same page. You can choose to use GET or POST as the form submission types, in some cases GET parameter is more suitable since it will produce the searched query as url parameter that can be saved and reused without search form re-submission. It is also possible to define custom form submission page url or force it to redirect to the default Property Archive Page as defined in the property main configuration form. This is useful if you have the search form in different page than the search results page. The Ajax options when enabled will always keep the search query to the same page and search for an instance of Listing shortcode matched by Loop ID. The value of Property Loop ID must match to the value of the Listing unique loop id that we will create in the next step. We are going to use the Listing shortcode to act as a the search results display as we have set the property search form previously to use Ajax mode. We need to use the Custom Loop Query mode on the Listing shortcode which will allow us to define the Unique Loop ID and the default query parameters for retrieving the property post from the database. At the minimum, we need to limit the post type and post status to post type: property and post status: published so the query will only fetch property post type that is published when retrieving data from database. then to ensure the ordering of fetched result remain the same on each search results, we must define the order direction and its ordering by. Then we enable the pagination by defining how many posts per page should the query limit for each page load, in this example we define 12 posts maximum for each page load or search load. Finally, we must define the Unique loop id and match it with the search form Property Loop ID value so the search form know which loop instance to target for when performing the search query.